For someone who eats a lot of rice, you must be sick of the Cooking Rex. To help yourself, you can always invest in a good and reliable rice cooker. This may seem too posh, but for your own convenience, it’s the right move. Speaking of which, most people who buy it do not know how to use it properly. 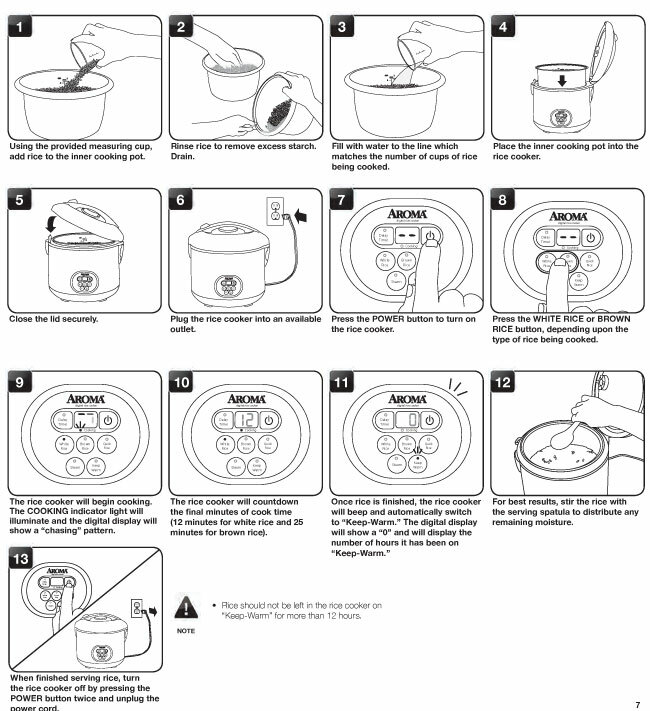 To help you guys out below is a basic guide for how to use a rice cooker. The instructions that come with a rice cooker are general, and they can be used with most of these. Still, it’s better to take out the manual and double check the instructions before you start working. It’s a universal ratio to pour 1 cup of water into 1 cup of rice. Use this ratio to scale up when you want to boil rice. You can start cooking small batches, to try it out to see what works and what doesn’t with your rice cooker. These cookers can be different according to each manufacture, but ultimately will be the same concept. Therefore you better start with the basic ratio. Adjust based on the type of rice, cooker and what dish you want to prepare. Also, don’t forget your personal preferences. The thing about rice cookers is they do most of the work for you. Once you are done with the rice and water, you need to close the lid. This will help you to heat things properly. Just keep up with the steam and pressure inside it. Don’t forget to turn the thing off once you are done. Most cookers have an on and off button, but you can adjust the cook timer and select auto-off once the job is done. Rinse the rice under running water before you put them in the cooker. This will wash of extra starch and makes the rice less sticky. Second, let them cook for 10 min before with the lid on before you serve them. This resting time will help to cook of the last of steam and leave you with fluffy rice and distinct grains. To clean and scoop all of the rice, you need to leave the lid open and let the inside of cooker dry out. This will make the leftover bits easy to clean brush off, and you can wipe the whole thing clean with a cloth. If the cooker is non-stick (which in most cases is), take precaution and avoid using metallic utensils as they will damage the coating. 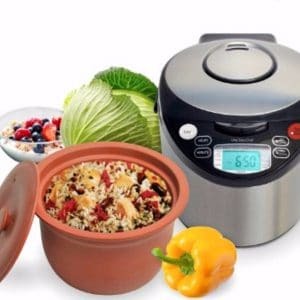 The VitaClay rice cooker is a great example of a cooker that is easy to clean. You need to Place the rice in a strainer and rinse it under running water. The water that runs through rice will appear as mildly first, but soon it will clear up. Don’t worry if there is still some haze in water. It’s fine, don’t dry the rice before cooking because the moisture will help you cook better. Put the rice in a strainer and run them under water once before you cook them. Do this for about 2 minutes and wait for the running water to clear. This will help you avoid a mash of rice when cooking. Put 1 cup of water if you want to cook 1 cup. Put them all in the cooker, and make sure you clean it properly before you use it. Stir in some salt and mix it. Turn on the device and select cooking option according to what you are cooking. You can refer to your manual for more details. The cooker will prepare rice itself and turn off once the job is down. Check your device for the given time. Once the rice is properly cooked, and the device shuts off. You need to let the rice rest there for 15 minutes. Don’t remove the lid or the rice will become sticky and mushy. If you have the time, try leaving the rice there for about 30 minutes or so before they can be served. Try to use a wooden or plastic spatula, never use metallic as they ruin rice. It will be a lot better if you just try to serve the rice straight out of the cooker. Serve them while they are warm. You better follow the same method for cooking other types of rice. Just make sure you check the manual and see what it has to say. Be specific about the water and rice ratio no matter how many cups you are going to make. Following are a few quick tips that will help you cook better rice. Read them thoroughly! You need to open the lid to eat them, but try to open it while the rice is cooking to the heat remains consistent. Never leave the lid open if you are not going to eat them all. Also, when you close the thing, make sure it is closed firmly. If you leave the rice open, they will dry out, and you won’t enjoy them at all. One more thing, leave the rice in cooker if you are not going to eat right away. The point is if you take it out early and let it sit, the rice will start to dry out. A tip here, take them out of the cooker as you eat them as most of these rice cookers will keep the rice warm for hours. We said to rinse your rice, but there is an exception. Don’t do it with jasmine and basmati as they have a subtle flavor and it will be washed down the drain. Just add a bit more water when you are cooking these. It will be all perfect. Hopefully this will give you an idea of how rice cookers work and what the basic process is. They really do make the job really easy and save you a lot of time in the kitchen. The rice will come out perfect and your family will love it. 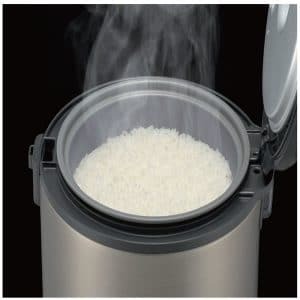 We have wrote an article here on the best rice cookers that you can research for the cooker that will fit your needs. It’s complete buyer guys on the top models to choose from with various price ranges that everyone can enjoy.